Most educated people are well-aware that ‘classical’ depictions of Jesus—the European look and long, brown, wavy hair—are not a realistic depiction of what he probably looked like. Critics of Christianity will sometimes use this to pick on us for our supposed lack of scientific and historical curiosity, as-if our artistic depictions of Jesus have any import on . . . anything. Surprise; art is not science! It is still an interesting thing to consider though. What did Jesus look like? Msgr. Charles Pope writes on the Archdiocese of Washington blog about this and, while he comes to no definitive conclusion (nor should he), he does present some food for thought. Jesus was a Jewish man, likely of Semitic origin. Hair styles at the time are believed to be shorter than the traditional depiction, and Semitic hair tends to be coarser and darker. Semitic men tended to have larger noses. The image at right is a forensic reconstruction based on the skull of a Semitic man from the 1st century. 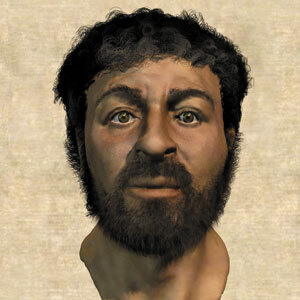 He probably looks a lot more like the real Jesus than the traditional, European depiction.